With spring comes a flitting about of butterflies and some interesting scientific news about this mystical insect from the University of California. Butterfly experts have suspected for more than 150 years that vision plays a big role in explaining wing color diversity. Now, for the first time, research led by University of California, Irvine, biologists proves this theory true – at least in nine Heliconius butterfly species. 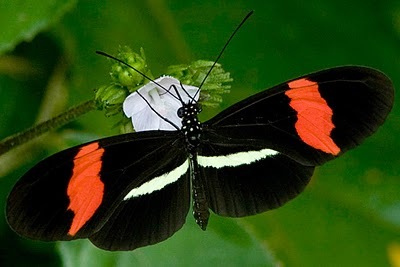 Adult butterflies, Heliconius or not, are amazingly diverse in shape, size, and color. Species are found on every continent, from mountaintops to rain forests to the frozen tundra. And, given that there are more than 25,000 butterfly species worldwide and probably gazillions of individual insects floating around, how species manage to find each other and mate is perplexing to those of us who lie awake at night worrying about these things. This new UCI research suggests seeing in a most unexpected way is the butterflies’ trick. Researchers Adriana Briscoe, Seth Bybee and colleagues found Heliconius butterflies have a duplicate gene that allows them to see ultraviolet colors and they also have ultraviolet (UV)-yellow pigment on their wings, making it easier to connect. The researchers conclude this is good for species survival because it leaves more time for reproducing, eating and sleeping. Not unlike their human counterparts once they take their Ray Bans and a few other things off. This behavior has been going on a long time she says, speculating that butterflies developed a copy of their UV-vision gene and began displaying UV-yellow pigment 12 million to 25 million years ago. Of the 25,000 butterfly species in the world, however, only the Heliconius living in the forests of Mexico and Central and South America are known to have this duplicate gene. “We think that by switching to a new way of making yellow, the mimetic butterfly species were better able to tell each other apart,” Briscoe said. The diverse wing patterns of Heliconius butterflies have generated much scientific interest in recent years, including a genome-sequencing project co-directed by UCI’s Robert Reed, assistant professor of ecology and evolutionary biology. I enjoy reading your blog, Kate–you are a talented and witty writer! I laughed out loud when I read that you usually put a plate on your pot instead of a lid! Your dry sense of humor is subtle but very effective. I can't wait to read your next blog! I enjoy your great photos too!